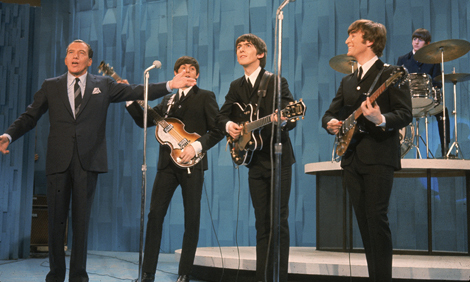 Ed Sullivan (far left) introduced the Beatles to America. From left to right: Paul McCartney, George Harrison, John Lennon, and Ringo Starr performed “She Loves You,” “I Want to Hold Your Hand,” and other soon-to-be hits. Fifty years ago, on February 9, 1964, 73 million people watched the Beatles appear on American television for the first time. A record 45 percent of households who owned televisions tuned in to see the British rock band perform on The Ed Sullivan Show, a popular variety program. Just several weeks earlier, the Beatles were nearly unknown in the United States. The Beatles were already very popular in their native Britain, but it was their appearance on The Ed Sullivan Show that started Beatlemania in America. “Beatlemania” was a term used to describe the extreme enthusiasm and excited behavior of Beatles fans. Before the Beatles, Americans had not been exposed to many British musical acts. The Beatles were a novelty, or something new and unusual, to them. Many Americans were won over by their catchy songs and excellent showmanship. They were also charmed by the group’s English accents, trademark black suits, and mop-top haircuts. The Beatles formed in Liverpool, England, in 1960, when they were still teenagers. They developed their sound from skiffle and 1950s rock and roll. Skiffle is a kind of music that was popular in Britain in the 1950s. It blended jazz, blues, and folk music and was often played on homemade instruments. As the 1960s progressed, the Beatles’ songwriting became more advanced. They helped shape the sound of modern rock and pop music. Their songs and style continue to influence music today. On January 27, 2014, the two remaining Beatles—bass guitarist Paul McCartney and drummer Ringo Starr—celebrated their American television anniversary. Together, they performed the Beatles’ classics “Sgt. Pepper’s Lonely Hearts Club Band,” “With a Little Help from My Friends,” and “Hey Jude” at a concert in Los Angeles. McCartney and Starr also paid tribute to their former band members—guitarists John Lennon and George Harrison. Lennon was shot and killed in 1980, and Harrison died of cancer in 2001. The concert was filmed for a two-hour television special called “The Night That Changed America: A Grammy Salute to The Beatles.” Stevie Wonder, Katy Perry, Brad Paisley, Alicia Keys, and others also performed Beatles songs as part of the celebration. The special aired on February 9 to celebrate the day, fifty years ago, when four young men from Liverpool changed popular culture in America forever. When did the Beatles first perform on American television? Where were the Beatles from?